San Francisco de Macorís is a city in the Dominican Republic located in the northeast portion of the island, in the Cibao region. It is the capital of the Duarte Province, and the sixth most populated city in the country. It is also known as the Land of Cacao ("Tierra del Cacao").The name San Francisco de Macorís comes from a fusion of the name of Saint Francis, patron saint of the Franciscan Order (a religious organization from Italy that had come to this territory during colonization) and the territory's old name, which is Macorix. The city of San Francisco de Macorís is located in the North Region of the Dominican Republic (Cibao Region) between the Septentrional Mountain Range at the north and the Cibao Valley at the southern part. San Francisco de Macorís has hills to the north which provide a great view of the city during evening hours. The Jaya River is prominent on the western part of town. The relief of Duarte Province ranges from 17 to 942 metres (56 to 3,091 ft) above sea level, reaching its highest elevation at "Loma Quita Espuela". This name allegedly comes from the time when the Spaniards were exploring the island, since the hill was too steep to ride their horses, they had to dismount and remove their spurs and undertake the ascent on foot. There are two main geologic regions: the north slope of the Cordillera Septentrional and the rough topography of the Delta del Yuna. On the southern slope of the Cibao Valley in the Yuna Subregion (Easter Cibao), we will find alluvial fans, in combination with deposit hollows, hill areas and platforms, and also alluvial soils into the channels of the flows of the rivers Camú and Yuna. Two faults go through the Duarte Province from east to west. This tectonic deformations are the Septentrional fault, that touches the towns of Arenoso, Castillo and San Francisco de Macorís and the Cibao fault passing through the towns of Las Guaranas, Castillo, Villa Riva Pimentel. 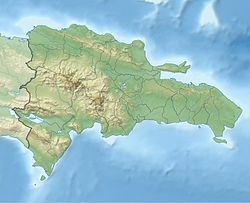 The Septentrional fault is located in the northern part of the province while the Cibao fault is located in the southern part of it. Yuna River Delta. It is part of the Cibao Valley, and most of these areas are located a few metres above sea level and therefore wetlands abound. Its main rivers are the Great Yuna and Caño Estero, which is the natural drainage of these lands in the province of Maria Trinidad Sanchez. Consists mainly of swamps with silt and clay, are also large areas of peat deposits. By the rivers are alluvial. Eastern Cibao Valley (Also part of the Cibao Valle). It is divided into the provinces of Santiago, Espaillat, Sánchez Ramírez, Sánchez and Duarte, the latter having a higher percentage (about 50%). All cities in this province are rooted in this valley except the city of Arenoso. The floodplains of the Yuna River system occupy a narrow strip on the south side of the valley and there is also a narrow chain of hills probably middle Miocene limestones adjacent to the North mountain range. For this province the valley also has marine lacustrine deposits of clay, basically of two kinds: a limestone and other no calcareous. The Haitises. They consist of a karst platform, which is composed of hard limestone from the Oligocene-Miocene. The highest elevations are generally 200 to 250 metres (656 to 820 ft)tall. The Payabo River crosses the region by a narrow channel filled with alluvial deposits. Northern Range. It is a mountain range of sedimentary rocks and highly faulted and folded fobáceas. In this province the Northern Range reaches heights of 942 metres (3,091 ft) (Quita Espuela); near San Francisco de Macorís the ridge height is slightly below 300 metres (984 ft). It presents some mudstone, limestone and Miocene and Eocene oligocénicos. To the south of Gaspar Hernandez and reaching the Nagua River there is a very complex area with rugged hills of limestone, tuff and probably with other volcanic and metamorphic rocks, mainly of Upper Cretaceous. There are many rivers and streams in the Duarte Province, being the most important ones: the Camú River, the Yuna River and their tributaries (Jaya, Cuaba, Nigua, Payabo, among others). The Yuna River and Camú River constitute important sources of water, both for drinking as irrigation. Environmental pollution in Duarte Province is the product of several elements such as the poor state of the latrines, untreated sewage, overflow of streams, indiscriminate use of agrochemicals, backwaters and installation of pigsties on the banks of rivers, as well as litter and some factories in the province that are thrown into rivers. Temperatures fluctuate between 17 to 32 °C (63 to 90 °F), with cooler temperatures affected by rainfall. It is largely an isolated paradise since much of the territory is unaffected by hurricanes or extremely hot weather. Occasional floods can occur due to a rainy season which manifests itself mostly during the month of May. The city founded near San Francisco de Macorís was founded in 1497. After the Vega Cotuí was established in 1505 in a place rich in gold. For centuries what is now San Francisco de Macorís and the province Duarte was rural outskirts of La Vega and Cotuí respectively. The Villa of Santa Ana of San Francisco de Macorís also previously called Hato Grande, was until 1718 owned by Francisco Ravelo Polanco, Provincial Mayor of the Santa Hermandad of Santiago de los Caballeros, and later the tradition points out to Juan de Alvarado and the families Tejada and De Jesus as the owners of the land and donors of the territorial area for the purpose of its foundation in 1778. That's errands General Manuel Maria Castillo that the October 2, 1896, the dictator Ulises Heureaux (Lilís) became the city of San Francisco de Macorís in Provincial District "Peacemaker" (title that his flatterers called Lilís). Back then he was assigned as common to Cantonal Position of Matanzas, Section Monte Abajo, Villa Riva, Canton Castillo, among others. District Peacemaker name lasted until the July 26, 1926, when the Legislature of the Government of General Horacio Vasquez, changed its name to Duarte Province, which remains today. On 20 May 1963 the city council approved the renaming of the main streets of San Francisco de Macorís the request of the Foundation Heroes of Constanza, Maimon and Estero Hondo. The delegation of the integrated Heroes Foundation Mrs. Rosa Elba Carron of Almánzar and Miss Angela Negrette. Currently, the leadership of the city jaya is supported on geographic location, potential and diversified natural resources directed to agricultural and livestock production, having as its main sources of domestic consumption and export cocoa and rice, other lines of production and trade; as livestock model in its plains and mountains. Such is the leadership, commercial and economic dynamism of the city, the most prestigious industries, companies, trading houses and banks, previous feasibility studies have established branches and representations by road and commercial interconnection with other villages in the city. The City Hall of San Francisco de Macoris, is the headquarters of the city council and city mayor. This structure is a mixture of Gothic and modern architecture. It covers a complete city block, bound in the north by Santa Ana Street, in the south by Colon Street, on the west by Papi Olivier Street and on the east by Restauracion Street. The Santa Ana Cathedral is the headquarters of Obispo de la Diócesis de San Francisco and home to the humanist Monseñor Jesús María de Jesús Moya. San Francisco de Macoris, has several radio stations and publications. Its longest running newspaper is El Jaya, which was founded November 20, 1985. Its director and founder is the journalist Adriano Cruz Marte. ^ González Hernández, Julio Amable (August 16, 2008). "Familias de pueblos: San Francisco de Macorís". Cápsulas Genealógicas en Areíto: Sección Sabatina del diario "Hoy" (in Spanish). Instituto Dominicano de Genealogía. Retrieved August 24, 2014. ^ "Expansión Urbana de las ciudades capitales de RD: 1988-2010" (in Spanish). Santo Domingo: Oficina Nacional de Estadística. May 1, 2015. ISBN 978-9945-8984-3-9. Archived from the original on July 14, 2016. Retrieved January 25, 2016. ^ "Provincia Duarte: "Capital mundial"del cacao orgánico"". ^ "Top 10 Cocoa Producing Countries". ^ "S. F. Macoris Climate Normals 1961-1990". National Oceanic and Atmospheric Administration. Retrieved September 19, 2016. ^ "La Historia de la Parroquia Santa Ana (2da Parte)". ElJaya. ^ Hernandez Gonzalez, Manuel Vicente. "Expansion fundacional y desarrollo en el norte dominicano (1680-1795) (p.154)". ^ "Historia de San Francisco de Macorís". Wikimedia Commons has media related to San Francisco de Macorís (Duarte).